Start your career in hairdressing now! Join us at the Forresters Hairdressing Training Academy, our group Hairdressing Training Centre in Reading, Berkshire. The Forresters Hairdressing Training Academy provides Level 2 Apprenticeships in Hairdressing to a Professional Standard. 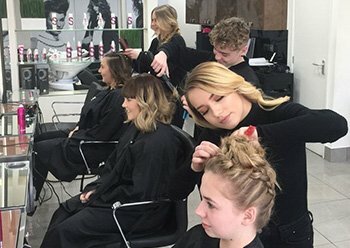 If you’re 16 and leaving school this year, we want to hear from you..
Training is conducted in a real world environment with dedicated teaching rooms and a working salon. Forresters encourages students to achieve their full potential in a professional, friendly and supportive learning environment. All of our tutors are fully qualified hairdressers with many years experience in all aspects of this exciting and creative industry. You could become a fashion hairdresser, working on photographic shoots for magazines or work in television, stage or the film industry. If you like the idea of teaching, you could become a training expert and teach the hairdressers of the future. The possibilities truly are endless, all it takes is hard work, creative flair and dedication. Be the best you can be and train in hairdressing with the Forresters group. See the creativity of some of our learners during their final Graduation in our news story. Supporting your journey into work.